“Galactica” was born as a vision in a dream with lines of gold light circling around a star-filled midnight sky. The magic of Galactica lies in its unique spiritual geometry in the rotating asymmetrical orbiting lines of Gold perfectly balanced to reveal a different constellation of diamonds. The magic of Galactica lies in its unique spiritual geometry in that the orbiting lines of Gold are asymmetrical, yet perfectly balanced to reveal a different constellation of diamonds as it rotates 360 degrees. The chain is hand-made in 18K Gold, the frames are in 18K Gold and the elongated spheres are made in Knightsteel. There are 133 round brilliant Diamonds with a total weight of 2.0 ct. These diamonds are D to F in color and Internally Flawless to VVS in clarity with excellent polish, proportions and symmetry. 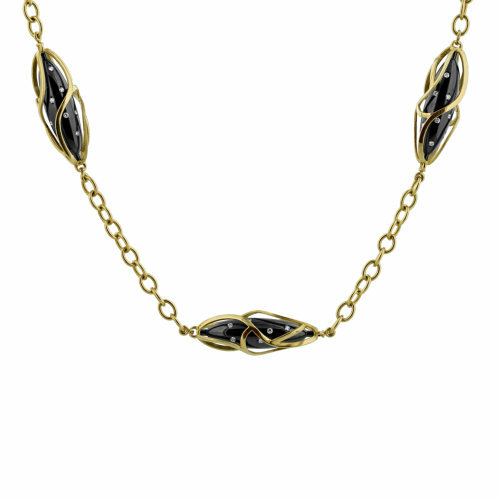 This necklace is 27.5″ long, so it can be worn full length or in a “Y” style.